The vast majority of observations in the ultraviolet, optical, and near-infrared ranges are performed with semiconductor-based detectors. Although these detectors are extremely efficient and reliable, there are some limitations: the wavelength range is limited by the bandgap of the semiconductor, and those at room temperature suffer from high thermal noise. By cooling detectors to cryogenic temperatures, different semiconductors with smaller bandgaps can be used — but they are still limited in wavelength. New cryogenic technologies have emerged in recent years, including Superconducting Tunnel Junctions and Transition Edge Sensors. 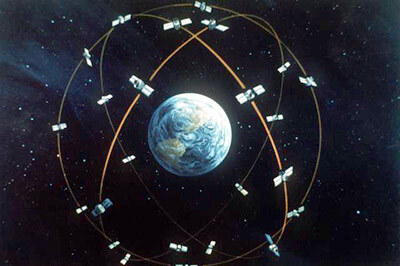 While they work well, it is difficult to fabricate them in the large arrays necessary for modern astronomy. Microwave Kinetic Inductance Detectors (MKIDs), developed over the last 10 years, are a cryogenic detector technology offering significant advantages over other methods: they are extremely sensitive and can be multiplexed into very large arrays. They have already seen success in millimeter astronomy. In this paper, the authors demonstrate the first photon-counting MKID array with 1024 pixels operating in the UV, optical, and near-IR. Figure 1 shows the operation of a single MKID pixel. When an incident photon hits the surface of a superconductor, it breaks Cooper pairs (two weakly bound electrons) in the material. The inductance of the material is inversely proportional to the Cooper pair density, so an absorbed photon increases the inductance. Combined with a capacitor, the inductance creates a resonant circuit with a characteristic frequency. This frequency thus changes with the absorption of photons. If the circuit is excited by a microwave probe tuned near the resonant frequency, photons will be seen as changes in the phase and amplitude of the probe signal. These circuits are very high quality resonators (the Q factor, or center frequency divided by the width of resonator, is about 18000), so photon energy and arrival time can be determined to within several percent and a microsecond, respectively. Figure 1: Basic MKID Operation. (a) Photons are aborbed, breaking Cooper pairs in the superconducting film and changing the inductance. (b) The film is placed in a resonant circuit. (c) The amplitude and (d) phase change of the resonance due to inductance change are measured, indicating the photon energy. The previous section described the operation of a single pixel, but the real challenge lies in placing many hundreds of these pixels in an array. This is done through the magic of photolithography and frequency-domain multiplexing: during fabrication, each pixel is tuned to a different resonant frequency by changing the total length of the inductor. Figure 2 shows an image of the circuit itself. Figure 2: A single MKID pixel. The circuit elements (inductor and capacitor) are visible. The resonant frequency is changed by adjusting the length of the trombone feature. Note the size of the pixel -- only several tens of microns! 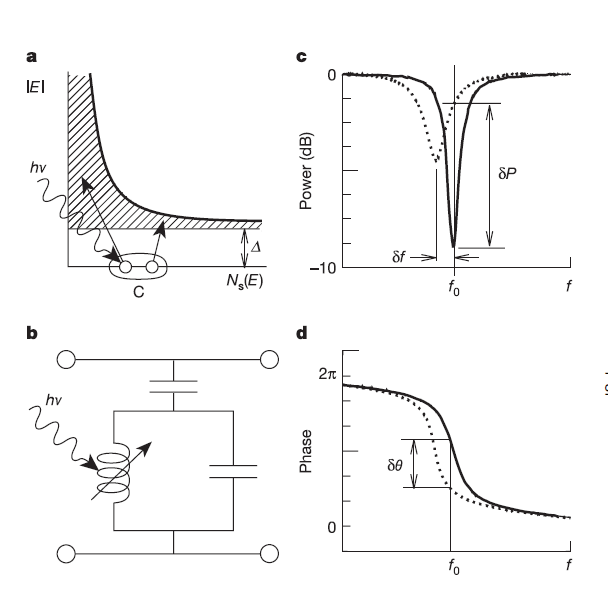 Once the circuits are connected together, a “comb” of microwave probe signals is sent into the device, and each resonant spike (seen in Figure 3) can be monitored for the changes in phase and amplitude characteristic of an absorbed photon. The high Q of the resonators ensures that there is little cross talk between the frequency channels. Figure 3: The top panel shows the equivalent circuit of several multiplexed MKIDs. The bottom panel shows the microwave transmission data, with each spike indicating a single pixel. The authors constructed an 1024- element MKID sensitive from 0.1 microns (UV) to 5 microns (IR). The superconducting film is made of titanium nitride, and was cooled to 100 mK. 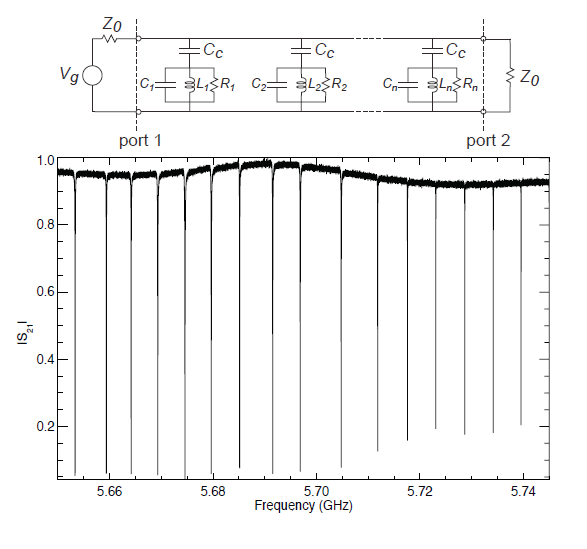 The resonators are each separated by 2 MHz across the 4-5 GHz band. To test the array, the authors illuminated the MKID with 254 nm mercury line photons and looked at the characteristic phase variation as a function of time after photon arrival (Figure 4). 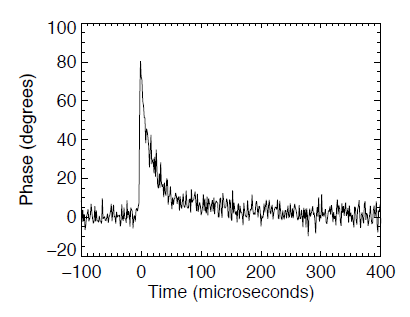 Figure 4: A characteristic pulse from a 254 nm incident photon. The fall time of 50 microseconds limits the maximum counts to about 2000 counts/pixel/second. In addition to lab testing, optical MKIDs are now being tested on the 200-inch telescope at Palomar on many astronomical objects. 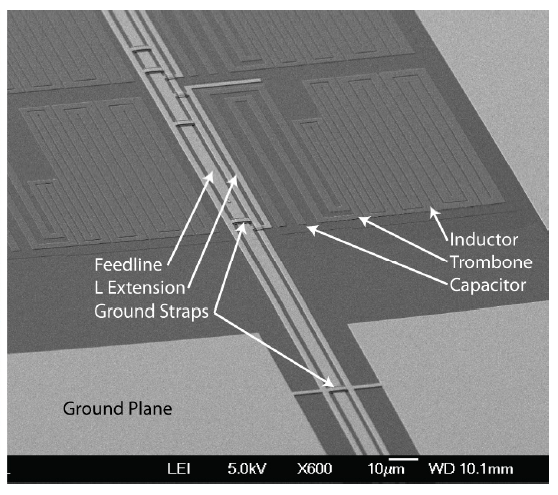 Although there are significant improvements that can be made to increase energy resolution, pixel uniformity, and fabrication yield, this experiment demonstrates the utility of MKIDs as a viable technology for large arrays — up to 10,000 resonators could eventually be placed on the detector!